Our focus today is our good, old pal, Ernie, who although he’s best known as being half of one of Sesame Street‘s longest-lasting power couples, often had a number of sketches on his own, as well. Interestingly, although with Bert, Ernie would often be the–for lack of a better word–tormentor, inflicting his unique Ernie-osity upon him and often driving our favorite fussbudget to scream, flail, faint, run away, or some combination of the above, Ernie didn’t necessarily share the same dynamic with other characters, some of whom wouldn’t put up with his fun-loving shenanigans at all (reiterating that, underneath the surface, Bert really does love him), and others of whom actually ended up placing Ernie in the traditional Bert role themselves, giving him a taste of his own medicine, so to speak. Sesame St S2: Songs, Etc. Today, I begin my survey of clips from Sesame Street Season 2. As usual, I watched the first batch on the Sesame Street: Old School Volume 1 DVD set’s “Classic Cuts” section. First off, we have another sequence I remember fondly from childhood, “King of 8,” about a Jim-Henson-voiced monarch who loves the number 8 so much that he demands that everything in his kingdom be numbered thusly, from the flags on and windows in his castle to his guards to his daughters to the jewels on each one’s crown. Take note, however, that this doesn’t extend to sharing the royal title with 7 other kings or having 7 other wives. And speaking of marriage, his solitary wife causes some upset at the end of the bit by giving birth to a ninth daughter, of which he is informed by his one and only jester, shortly before the poor bloke is flattened by the 8 sign. Perhaps this balances out the numbers a bit? 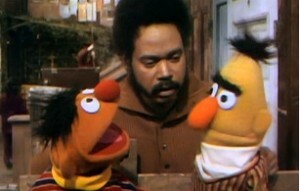 Gordon interrupts Ernie and Bert’s argument. 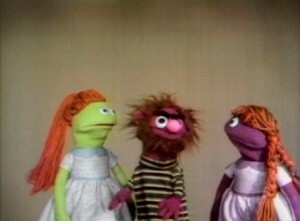 As I alluded to in previous posts, when the already monumentally successful Sesame Street returned for its second season premiere on November 9, 1970 (available for purchase as part of the Sesame Street: Old School Volume 1 DVD set), it featured some changes that came about as a result of discovering what worked and what didn’t during their first experimental year. One of the most instantly striking features about this episode is just how big and full the street now seems. 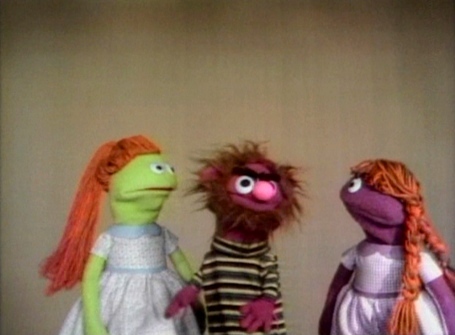 Compared to the small handful of people who greeted viewers in the first aired episode, the first pan shot of this episode is stuffed with characters: adults, children, and perhaps most importantly, Muppets. Before proceeding on with Sesame Street‘s second season, today I took a look at a number of variety show appearances that Jim Henson and his Muppets team continued to do, both during Sesame Street‘s opening season and afterwards, during the summer hiatus.